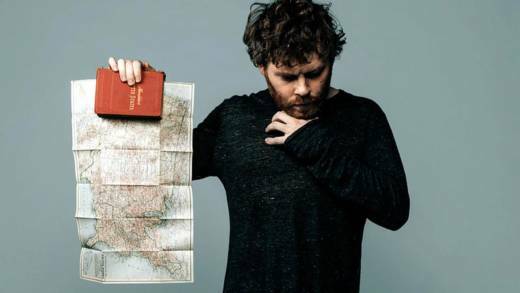 If you recognize Gabriel Kahane's last name, you're not alone, at least in the Bay Area. For 10 years, his father Jeffrey Kahane conducted the Santa Rosa Symphony, and appeared as a concert pianist throughout the region. But the apple did not fall far from the tree, and once it did, it swiftly rolled to New York City. Kahane the Younger isn't a classical musician per se, but his music and voice has a chamber-pop sensibility—the kind that lends projects like Craigslistlieder, his song cycle based on Craigslist personal ads, a stamp of formality. But for his latest album, Kahane went decidedly less formal, and hopped on a train to criss-cross America for two weeks with no phone and no internet, talking to strangers along the way. He left the station on Nov. 9, 2016. The result, Book of Travelers, is a series of songs capturing a post-Trump America, often based on Kahane's verbatim conversations with people. Primarily, he wanted to see just how similar we in a supposedly divided nation really were. As he told NPR last year, "I had a perception that some of the polarization was manufactured by the internet and by media and, in a sense, by a ruling class that benefits from division." On Jan. 26, Kahane brings songs from Book of Travelers to this year's Pivot series, spanning four days at Herbst Theatre. Also on the schedule are pianist Ran Dank in his San Francisco recital debut (Jan. 24), bass-baritone Dashon Burton singing songs of struggle and redemption (Jan. 27), and jazz vocalist Paula West (Jan. 25) in what's sure to be a commanding set of Bob Dylan songs. But pardon our delight at another name on the bill. Cy Musiker, former host of KQED's The Do List, hikes down from his country hill to moderate post-concert discussions with the artists on each of the festival's four nights. He retired from KQED last year, and we already miss the guy. Smart and affable, Musiker brings an experience and curiosity that should provide plenty of jump-offs for insight on music's role in these insane times. The Pivot series runs Jan 24–27 at the Herbst Theatre. Details here.